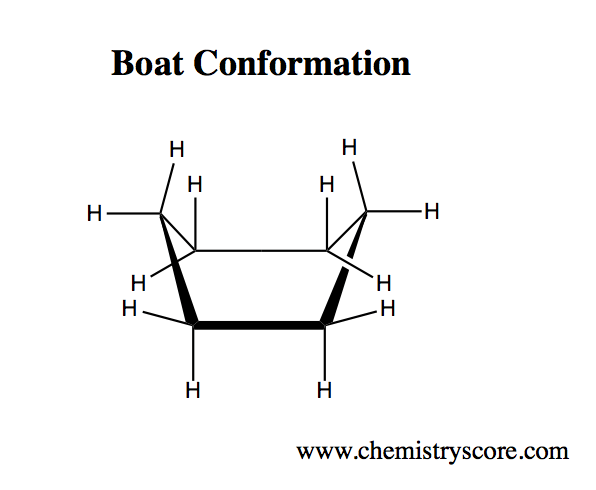 The definition of Boat Conformation, in organic chemistry, is a conformation of cyclohexane in which all bond angles are fairly close to 109.5° and many hydrogen atoms are eclipsing each other. When talking about conformation, especially when it comes to how a reaction is carried out, it’s important to note two main sources of strain, angle strain and torsional strain. Because the boat conformation renders the atoms a angle of about 109.5˚, there is very little angle strain between the molecules. However, torsional strain does exist in the boat conformation. Because the H’s are eclipsed, on both sides, there comes to be steric interaction between the H’s, which are termed flagpole interactions.